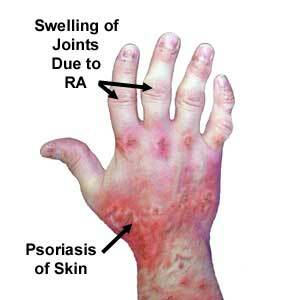 Psoriasis and Psoriatic Arthritis are thought to be caused primarily by your immune system. Not everyone who has psoriasis — which causes patches or plaques of scaly and inflamed skin — develops psoriatic arthritis. This form of inflammatory arthritis causes joint swelling and pain, and may lead to permanent deformity and damage if not treated. Up to 30 percent of people with psoriasis also develop psoriatic arthritis, which causes pain, stiffness and swelling in and around the joints. Psoriatic arthritis can develop at any time, but it most commonly appears between the ages of 30 and 50. Genes, the immune system and environmental factors are all believed to play a role in the onset of the disease. With psoriasis, cells grow too quickly without sloughing off. Layers of skin build up, resulting in the skin plaques of psoriasis. With psoriatic arthritis, the immune system targets joints and connective tissue, causing destructive, painful, swollen joints. There does not seem to be a connection between where the scaly skin patches from psoriasis are located and which joints are affected by psoriatic arthritis. For example, you could have skin lesions on both your elbows, but your elbow joints could be unaffected by psoriatic arthritis. Also, psoriatic arthritis could cause sausage-like swelling of the toes without any redness or scaling on the feet. Digestive issues in psoriasis have been found in many cases. Researchers have found increased intestinal permeability and microscopic bowel lesions. Some people with psoriasis have celiac disease, Crohn’s disease, gastritis, duodenitis, or inflammatory bowel disease. Disturbances in pancreatic function and even acute pancreatitis have been found to be common in people with psoriasis. Most ailments can be attributed to a poor digestive tract. After all, that is where are nutrients are absorbed the most. People with psoriasis have been shown to have higher levels of toxins called polyamines. These toxins are produced when protein digestion is incomplete or proteins poorly absorbed and bacteria break down and forms toxins. Polyamines block the production of cyclic AMP. However, vitamin A and goldenseal supplements can inhibit the formation of polyamines. Because protein digestion begins in the stomach, lows levels of hydrochloric acid there can also cause incomplete protein digestion. Digestive enzymes and/or hydrochloric acid supplements are recommended to aid protein digestion. People with psoriasis have high levels of IgE antibodies, which indicate an allergic component. 16% of people with psoriasis had antibodies to gliadin, the protein found in wheat, rye, and barley. However, when tested for gliadin intolerance, their endomysium antibodies were normal. But a gluten-free diet for 3 months improved their psoriasis. People with psoriasis also had high levels of tissue transglutaminase antibodies in skin, which decreased by half after a 3-6 month gluten-free diet. 1. Symmetric arthritis is much like rheumatoid arthritis but generally milder with less deformity. It usually affects multiple symmetric pairs of joints (occurs in the same joints on both sides of the body) and can be disabling. 2. Asymmetric arthritis can involve a few or many joints and does not occur in the same joints on both sides of the body. It can affect any joint, such as the knee, hip, ankle or wrist. The hands and feet may have enlarged “sausage” digits. The joints may also be warm, tender and red. Individuals may experience periodic joint pain. This form is generally mild, although some people might be disabling to some people. 3. Distal interphalangeal predominant (DIP) occurs in only about 5 percent of people with psoriatic arthritis. Primarily, it involves the distal joints of the fingers and toes (the joint closest to the nail). Sometimes it is confused with osteoarthritis, but with DIP, there usually are nail changes. 4. Spondylitis is inflammation of the spinal column. In about 5 percent of individuals with psoriatic arthritis, spondylitis is the predominant symptom. Inflammation with stiffness of the neck, lower back, sacroiliac or spinal vertebrae are common symptoms in a larger number of patients, making it painful to move. Peripheral disease can be present in the hands, arms, hips, legs and feet. 5. Arthritis mutilans is a severe, deforming and destructive arthritis that affects fewer than 5 percent of people with psoriatic arthritis. It mainly affects the small joints of the hands and feet, but can affect neck or lower back pain. 1. Injury to the skin — Injury to the skin has been associated with plaque psoriasis. For example, a skin infection, skin inflammation, or even excessive scratching can trigger psoriasis. 2. Sunlight — Most people generally consider sunlight to be beneficial for their psoriasis. However, a small minority find that strong sunlight aggravates their symptoms. A bad sunburn may worsen psoriasis. 3. Streptococcal infections — Some evidence suggests that streptococcal infections may cause a type of plaque psoriasis. These bacterial infectionshave been shown to cause guttate psoriasis, a type of psoriasis that looks like small red drops on the skin. 4. HIV — Psoriasis typically worsens after an individual has been infected with HIV. However, psoriasis often becomes less active in advanced HIV infection. 6. Emotional stress — Many people see an increase in their psoriasis when emotional stress is increased. 7. Smoking — Cigarette smokers have an increased risk of chronic plaque psoriasis. 8. Alcohol — Alcohol is considered a risk factor for psoriasis, particularly in young to middle-aged men. 9. Hormone changes — The severity of psoriasis may fluctuate with hormonal changes. The disease frequency peaks during puberty and menopause. A pregnant woman’s symptoms are more likely to improve than worsen during pregnancy, if any changes occur at all. In contrast, symptoms are more likely to flare in the period after childbirth, if any changes occur at all. Certain foods cause inflammation in the body. Processed foods, sugars, and starches cause inflammation in the body. It’s important to stay away from them. Another thing to keep in mind is read labels. It is VERY important to do this. MOST dairy products and toothpaste have carrageenan in it. AVOID CARRAGEENAN!!!! I can’t stress that enough. Carrageenan causes inflammation in the body. Silk Brand Almond Milk is the ONLY almond milk brand that does NOT have carrageenan in it. Dairy products also cause Inflammation throughout your body, which is another reason to switch from cow’s milk to Almond or Coconut Milk. Pomegranates are anti-inflammatory and slows down the degradation process of the cartilage. Milk Thistle – liver detoxifer; take 3-6 capsules of 175 mg standard 80% milk thistle extract daily with water before meals. Common sources of animal omega–3 EPA and DHA fatty acids include fish oils, algal oils, egg oil, squid oils, krill oil and some plant oils contain the omega 3 ALA fatty acid, such as sea buckthorn seed and berry oils, flaxseed oil, Sacha Inci oil, Echium oil, ad hemp oil. Capsasin – found in chili peppers, such as cayenne. Use creams that have capsasin in it. It blocks nerve endings that transmit pain. Plus, it reduces pain, inflammation, redness, and scaling. Epsom Salt – soak in bath for 15 minutes. Apply moisturizer once you are out of tub. People with psoriasis are usually deficient in vitamin A, vitamin D, vitamin E, folic acid, selenium, chromium, and zinc. Folic Acid – 400 mcg daily. Improvements are usually seen in 3-6 months. It is recommended to take vitamin B12 with it. Selenium – 200 mcg daily (not more since it can be toxic). One or two brazil nuts each day equals 200 mcg. Zinc – 50 mg per day to improve immune function and joint symptoms. Zinc does not eliminate psoriasis. * You may notice that after modifying your diet (eliminating dairy, eliminating gluten, etc), your psoriasis may worsen. This is normal because toxins are being released from your body. After a few months, it should improve. * * Essential Oil recipe for Eczema and psoriases – Equal parts 1-2 drops of Lavender, Rosemary and Cedarwood with Fractionated Coconut Oil, apply to skin as needed.